Some health services do not need to be sited at an acute care hospital, but lack of appropriate infrastructure means that providers have no option but to offer these services at existing hospital sites. Our mobile facilities offer increased flexibility to move care into the community and closer to patients’ homes. Large providers, such as NHS Trusts, can use Vanguard mobile facilities to increase accessibility of services like outpatient clinics or endoscopy screening programmes. Smaller providers, from GP surgeries to community hospitals, can utilise mobile facilities to gain wider autonomy, allowing them to offer patients services outside of the acute hospital setting. For Trusts or CCGs looking to integrate care solutions, our community care model, called Healthportability, gives access to a range of elective and diagnostic services in the community. The system works through a combination of a modular docking unit, which can be installed on even space-constrained sites, and mobile healthcare facilities, which can be connected to the dock easily and quickly for as long as they are needed. This gives providers, and their patients, access to quality clinical environments where theatre of endoscopy services can be made available on demand, without the need for significant capital investment. 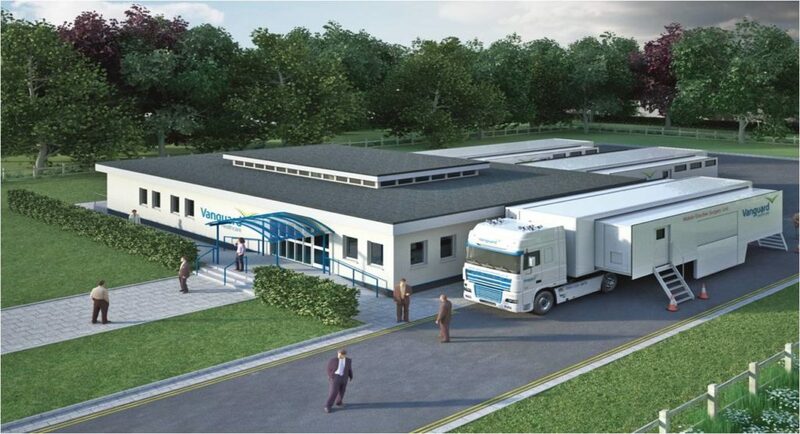 The mobile facilities, whether they are operating theatres, endoscopy suites or day surgeries, are available fully equipped, which means that providers do not need to buy a stock of their own equipment to utilise. Flexible staffing options are also available through our own clinical staffing resources and our partners’, giving community providers access to a full-service solution that meets the needs of their patient population as and when those needs arise.